Last time, I discussed the power of the Undertaker in Hearthstone and how I was hoping to take advantage of its powerful synergies in a different Constructed deck. One day, as I was watching TrumpSC stream, he battled against a Hunter list I had never seen before that paired Undertaker with a bunch of solid Deathrattle minions and combined that with Mad Scientist to draw into the Hunter's Secrets. Intrigued, I took to Google to discover whether such a list had been published yet. It took a bit of searching, but I eventually came across this list. Although I lacked the Legendary Leeroy Jenkins, I had all the rest of the cards, and thus quickly assembled them into a deck I dubbed the Hunter-taker. 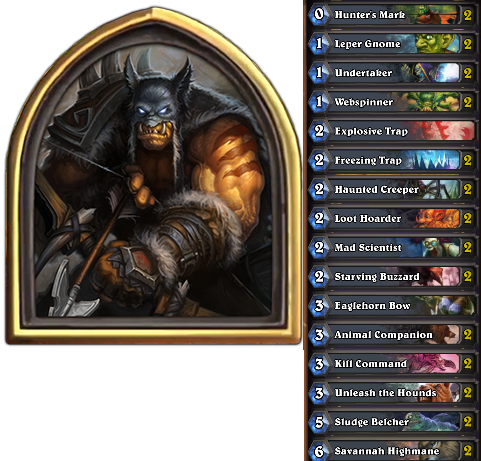 I ended up also cutting Loatheb to make room for a pair of Sludge Belchers, which do a surprisingly good job of protecting the Hunter's more fragile minions in the mid- to late-game, enabling you to push through the last few points of damage. The results surprised me. For the first time ever, I found myself rapidly climbing up the ranks in the Ranked Constructed queues, allowing me to push into single-digit rankings for the first time. I am currently Rank 8, and in the few days left for this season of Constructed play, I am hoping to make a serious push towards Legendary. But even if I don't make that goal, I have already accomplished more than I expected. Interestingly enough, Hearthstone expert and well-known streamer Reynad popularized a similar list on his stream last week, which you can read all about here. Looks like I am definitely onto something good! Next time, I'll take a look at what I've been playing in MPDC the past two Mondays - White Weenie tokens!